Alas, there is an even greater scam that is being perpetrated on the Filipino people, beside which, in terms of orders of magnitude, the pork barrel pales in comparison. A scam that allows the rich to get richer, and the poor to get screwed coming and going. A scam that affects not just the present generation, but also generations to come…. What humongous scam is this? That foisted by the Philippine Mining Act of 1995 or Republic Act 7942. Let us see official data from the MGB-DENR to check the validity of some points by my former teacher in UPSE in the mid-80s. One, there are many taxes and fees imposed by the national government other than the excise tax: corporate income tax, VAT, royalties, documentary stamp tax, capital gains tax, withholding tax on dividends, withholding tax on interest payment, customs tax on imported vehicles, vehicle registration tax, MGB fee, other national taxes and fees. Plus taxes and fees by local government units (LGUs): business tax, real property tax, community tax, occupation fee, extraction fee, wharfage fee, other taxes and fees. In 2011, government, national and local, collected P22.23 billion. Two, small scale mining (SSM) do not pay national taxes, only small local fees, despite producing some P43 billion in 2010 and P34 billion in 2011. Just how small is tax payment by SSM to LGUs? Take the case of two of the most mineral-rich provinces in the country. * For South Cotabato, includes tax collection from sand and gravel. Source: Alternative Forum for Research in Mindanao (AFRIM), March 2012, A Background on Small Scale Mining in Benguet and South Cotabato and their Impact on the Economy, the Environment and the Community. Original and official data are from S. Cotabato and Benguet provincial governments. S. Cotabato is a mineral rich province. Tampakan copper-gold mining project is supposed to be located there but the provincial government stopped it as it will not allow open-pit mining. Yet the provincial government collected only P6.6 M in 2010 and P9.7 M in 2011 from SSM. Benguet’s provincial collection was even smaller, only P8,100 in 2009 and P22,100 in 2010. From the same AFRIM report, it says that of the 69 SSM operators in 2010, only 8 were registered and only 5 have payment records. Three, with such minuscule tax payment to LGUs and zero tax payment to the national government, it is safe to assume that up to 99 percent of the P22.23 billion collection in 2011, or P22 billion, were paid by large-scale metallic mining (LSMM) and non-metallic mining (NMM) firms. We can construct this computation from the above numbers. * 2010 tax breakdown source: Dr. Artemio Disini, COMP. Presentation at the Philippine Economic Society Conference (PES), November 27, 2012, PICC, Manila. No breakdown of tax payment among LSMM, NMM and SSM at the MGB data. At 39.4 percent combined payment by LSMM and NMM in 2011, and seeing their proportional payment in 2010, it is safe to assume that LSMM paid about 50 percent of their net revenues to the government. Four, on top of those taxes and fees paid, LSMM are also required by RA 7942, Chapter X, and DENR Administrative Order (DAO) 2010-21 (IRR of RA 7942) requires LSMM to have Social Development and Management Program (SDMP) for the communities where they are operating. In 2010 alone, this was more than half billion pesos from members of the Chamber of Mines of the Philippines (COMP) alone. Since SDMP (school, hospital, livelihood trainings, tractors, etc.) is not counted as part of operating expenses, then it can be considered as additional tax and fee that goes direct to the people in the communities, not to the BIR and LGUs. About 10 or so years ago, the value placed on the metallic minerals in the country was something like $900 billion. Assuming an exchange rate of P40=$1, we’re talking P36 trillion. Subtracting development and production costs assumed to be 60 percent of that value, the gross profits before tax would be P14.4 trillion. Using the Malampaya formula, the share of the government/Filipino people would come out to P8.64 trillion. Using the 2-percent formula of the Philippine Mining Act, our share is P720 billion—or eight hundredths of one percent (0.08 percent) of what we would have gotten using Malampaya. In effect, if all those mineral resources had been extracted, under RA 7942, the loss to the Filipino people would be P7.92 trillion. And this does not even take into consideration the cost of the adverse environmental effects of mining. The above computation by my former teacher is wrong, here is why. One, based on taxes and fees paid by LSMM in 2010 (43 percent) and 2011 (about 50 percent), the tax multiplier to be used should be around 46 percent, not two percent. A comparison of Prof. Monsod’s numbers vs more realistic numbers can be constructed. Two, even if an amendment to RA 7942 in mining taxation will be enacted and move from excise tax of two percent ++ existing taxes and fees to a Malampaya gas revenue sharing (government 60%, private/Shell 40%), the potential difference in revenue collection will only be around P2.02 trillion and not P8.35 or P7.92 trillion). And if SDMP spending is included, the difference will narrow down to perhaps only P1.8 trillion. Three, “adverse environmental effects of mining” applies mainly to practices by SSM (see Mt. Diwalwal for instance) and not by LSMM. 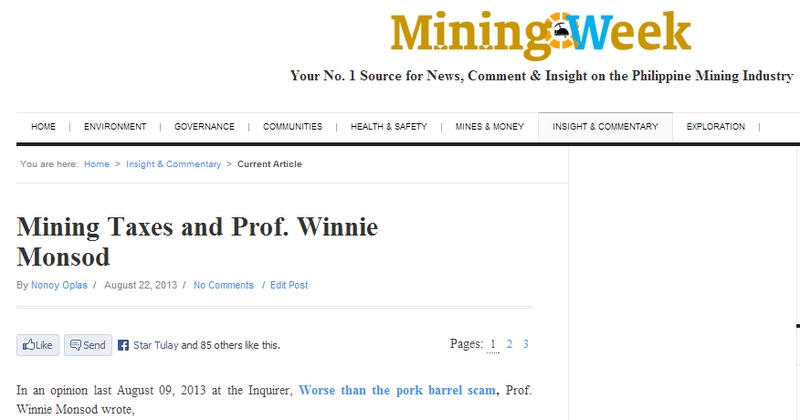 But again, Prof. Monsod was silent about SSM in her article. In short, Prof. Monsod’s paper is more about revenue exaggeration and alarmism and not based on realistic numbers based on existing revenue policies of the government, both national and local. Stem Cell 1: PhilHealth to Cover SCT?